Puretch™ is a biodegradeable, negative working dry film photopolymer. It has the highest resolution possible with a dry film; the thinner the film the higher the resolution. Puretch was originally marketed by Cape Fear Press to artists for the use of fine art photo etching but it is originally designed for PCB manufacturing. It is easy to use with non-industrial techniques and is available in quantities ideal for the DIYers. Developer is not included with film. 100% Sodium Carbonate is the developer and can be bought by the half pound on the products page. Negative Working Photopolymer means that areas of copper that are not exposed and covered with a black line will etch away, leaving the circuit path in the clear areas of the art work. Make sure you prepare art accordingly. This may require inverting the black and white before printing transparencies. 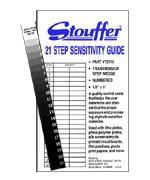 Establish perfect Puretch exposure times easily with the Stouffer step guide. There are many different ways for exposing plates. There are an abundance of different exposure systems and processing techniques. The one constant is the step tablet. Use the step tablet as a benchmark for all exposures to achieve accuracy and repeatability. Click on guide for instructions.